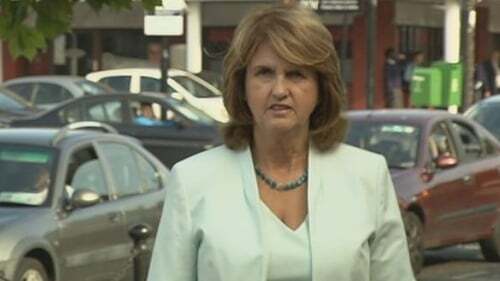 Joan Burton has accepted that not all those present at a water charges demonstration in November 2014 were involved in venomous behaviour towards her. The Labour TD and former tánaiste has been cross-examined for a third day in the trial of Solidarity TD Paul Murphy and six other men who are charged with falsely imprisoning her during a water charges protest in November 2014. Under cross-examination by defence counsel Ciaran O'Loughlin for one of the accused, Michael Banks, Ms Burton said the protesters used extreme language which was "full of venom and hatred". She "completely accepted" that not all those present had engaged in such behaviour. However, she did not accept that the demonstration was not directed at her personally. She said "things thrown at me and someone was shoving a camera into my face". Ms Burton said her line of sight was focused on those surrounding the four sides of her car in which she alleges she was trapped for up to three hours. It was put to her that the protesters had aimed their demonstration at her because she was the representative of government. Mr O'Loughlin said if she had not been there it would have been aimed at the junior minister Kevin Humphreys. Ms Burton said she did not think the demonstrators had any interest in Mr Humphreys and were using extreme language directed at her while another man tried to push a camera up close to her eye. Ms Burton also agreed with Mr O'Loughlin that she did not recognise anyone at the protest apart from Solidarity TD Paul Murphy. She did not see his client, Mr Banks. It was put to her that Mr Banks had attended a legitimate demonstration and while he could be seen on video making rude gestures towards her it "was all smiley". She said she simply did not know if Mr Banks was one of those people at the protest who did nothing untoward. "Is it fair to say there are some who are there to make up the numbers and some others who are polite and some who are impolite the same as any mixture in society?" Ms Burton replied: "I'm not an expert in demonstrations." Mr O'Loughlin asked if she agreed "there will be aggressive and less aggressive people"? Ms Burton replied that "protests in recent times have been very different to what has been the traditional ones in Ireland, which have been peaceful". Mr O’Loughlin said he accepted that what happened that afternoon went "way over the top" but said the purpose of a rally or march is to disrupt traffic. "I'm not aware of many people being locked in their car. Usually people who arrange such marches inform the gardaí and streets will be closed off." Mr O’Loughlin put it to her that "the idea [of protests] is to make a nuisance of yourself so that government ministers will sit up and say 'what are we going to do about it?'". Ms Burton said she was "not sure it worked liked that" and it depends on the purpose of the march. Senior counsel Michael O'Higgins, representing Ken Purcell, told Ms Burton he was not there to defend anyone who threw a water balloon or an egg, which he described as "an indefensible action". He said he was not there to defend anyone who obstructed her path in an unlawful way. He said while he was not defending the use of bad language which was "thoroughly distasteful and unpleasant" it should be water off a duck's back for the leader of a country. Ms Burton replied "not necessarily if it is accompanied by people raining blows down on a car and people are throwing things and there is a very high level of hullabaloo". She said she did not expect everyone to agree with her or like her, in general she experienced a mix of both but this was "a unique experience" for her. Mr O'Higgins asked if she as a leader of a country "who is out and about subjected to language which is very distasteful and utterly incoherent but in so far as a citizen of a country has a right to say it, it is part of freedom of expression and may be ugly and unpalatable, but you should big enough and bold enough to take it on board?" Ms Burton said she was not quite sure why he was asking that question. Mr O'Higgins said she would have to answer the questions and not wonder why he was asking them. Mr O'Higgins said video footage for a large part of the time in question showed the atmosphere was relaxed and gardaí could be seen chatting among themselves. Ms Burton disagreed that the footage did not record hostility during that time. Mr O'Higgins suggested the "tranquility" was broken with the arrival of the Public Order Unit. He said an examination of the video footage showed that between 13.40 and 14.55 a single, empty plastic bottle was thrown at the windscreen of the vehicle. He said this coincided with the arrival of the Public Order Unit and was done by a "tiny minority" and not representative of the group as a whole. Asked if she understood this, Ms Burton said she did. Mr O'HIggins also pointed to an audio recording from the garda helicopter in which officers at one point can be heard saying the jeep was making steady progress, the crowd had fairly dispersed and there was very little hassle. She said this did not accord with her recollection of events and the feeling of fear on the ground. He also suggested that the audio records a suggestion that the car could have reversed out but did not do so. Mr O'Higgins said this accords with a recording from within her car in which she could be heard laughing at that suggestion. Ms Burton said she was not laughing but was incredulous as the idea that the car would move backwards. Ms Burton repeated that she felt extremely intense fear at the time and was fearful of how she would get out of the car and where she would run to. In at times testy exchanges Mr O'Higgins asked Ms Burton why she did not simply answer the questions he was asking. He said one of the reasons she was not answering was because she was not listening to the questions and would prefer to address the jury on other matters. Mr O’Higgins put it to Ms Burton that one of the reasons people might have been angry was because there had been a period of unprecedented growth from 1996 to 2007 which came tumbling down with the global banking crisis. Ms Burton said she believed that reckless lending to construction and property sectors contributed to the economic collapse in Ireland. Mr O’Higgins also referred to the €64bn bank bailout programme which he said had resulted in "professional investors and gamblers who lost a bet getting their money back, with interest". Ms Burton said many of those bond holders included credit unions and people who had invested for their pensions. Mr O’Higgins asked her why the words "water protester" were completely absent from the statement she gave to gardaí. Ms Burton said she was asked to give her account of what happened that day and was not making a political statement. Mr O'Higgins said the statement was made against a backdrop of huge protests against water charges, the subject was constantly raised in the Dáil and on the news and yet she never mentioned water protesters in her statement. He asked if she would agree that the reason for this was not accidental but because she was trying to paint a picture to gardaí of a disorganised rabble and she was not going to acknowledge the existence of water protesters for fear it would give a veneer of legitimacy. Ms Burton said she would "absolutely disagree" with that. She said she was considerably upset while giving her statements because she had to relive the events but had given the statements in "all good faith and honesty". Ms Burton said perhaps it was a "psychological thing when being shouted at there are certain things that attract your attention more than other things". Mr O’Higgins asked if she had blanked things out through psychological pressures or otherwise did it make her an unreliable historian. She said she did not believe so because she had truthfully and honestly described what she had been subjected to and what her experience was. Mr O’Higgins said anyone who read her statement "would be left with the false impression that there was a rabble in Tallaght that called her profane names and would be left completely in the dark that this was a water charges protest which was the central feature of the event". He said her account she gave to gardaí was distorted, unfair and contained omissions and affected the reliability of her account. He said "that construction on your statement is unlikely to be accidental. It paints a picture of this event that is highly inaccurate and prejudicial to the accused." Ms Burton said "people did do those things and other people saw it". Mr O’Higgins also put it to Ms Burton that comments she made in the Dáil about water protesters having expensive camera phones was an attempt to impugn them. He said it implied that "if they can afford expensive phones paying water charges couldn't be that much of a deal and that they were manipulating the system when they didn't have a complaint and this was your way of undermining them?" She replied that she did not entertain those feelings at all and "you are wrong". Mr O’Higgins also pointed to a recording from inside the car in which Ms Burton tells her assistant that she should go on social media and say it was shameful that children were not being minded and were left to roam the streets. Ms Burton denied that this was a specific instruction and said it was just conversation. Mr O’Higgins read out a transcript of what was said and asked if a government minister and tánaiste telling an assistant to "go on social media and say something was not a direct explicit instruction". Ms Burton said it was not. She said it was never acted upon, but then conceded that she did not know this for certain. Her cross examination continues on Thursday. Paul Murphy TD; Dublin councillors Kieran Mahon and Michael Murphy; and four other men deny the charges against them. The offences are alleged to have occurred on 15 November 2014, as the then tánaiste was attending a graduation ceremony at An Cosán Centre in Jobstown in Tallaght. All seven defendants have pleaded not guilty to falsely imprisoning Ms Burton and her adviser, Karen O'Connell, in Jobstown in Dublin on 15 November 2014. The defendants are: Solidarity TD, Paul Murphy, 34, from Kingswood Heights, Tallaght; Councillor Michael Murphy, 53, from Whitechurch Way, Ballyboden in Dublin; Councillor Kieran Mahon, 39, from Bolbrook Grove, Tallaght; Scott Masterson, 34, from Carrigmore Drive, Tallaght; Frank Donaghy, 71, from Alpine Rise, Tallaght; Michael Banks, 46, Brookview Green, Tallaght; and Ken Purcell, 50, from Kiltalown Green, also in Tallaght. The trial is expected to last at least six weeks.